The Marie-Antoinette exhibition at the Grand Palais was so vast and complex that I wanted to let my impressions settle a bit before consigning them to cyberspace. The part of Marie-Antoinette’s life that was least familiar to me was her childhood in Vienna. In this regard the exhibition does a very good job of evoking of it through many paintings and a few carefully selected objects. What struck me was how family-oriented the Lorraine-Hapsburgs were, and wished to appear. 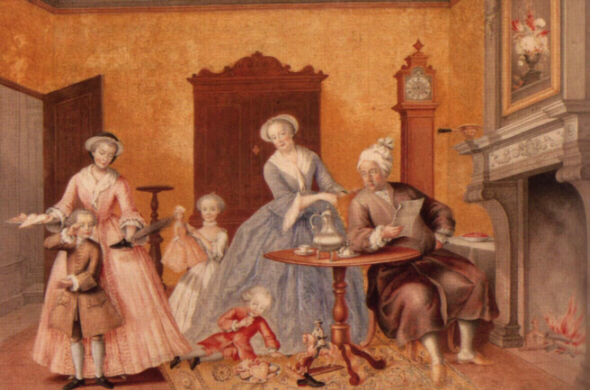 Of course imperial propaganda had probably much to do with it, but many of these family paintings in ordinary settings, those portraits of the imperial children seem to reflect genuine parental pride and care. Nothing equivalent is found in the French Court at the time. Marie-Antoinette, the youngest girl of a family of sixteen children, seems to have enjoyed a very happy childhood in the relatively relaxed atmosphere of the Hapsburg court. This explains her difficulties in adapting to the far more formal setting of Versailles. Marie-Antoinette is a pawn in a game of international alliances of which at first she does not seem to grasp the import. We soon reach the formalities of her wedding to the Dauphin, future Louis XVI. Marie-Antoinette’s original marriage certificate is displayed. There is an ink stain next to her signature (did she make it herself?) and she misspelled the French form of her name. She signed Marie Antoinette Josèphe Janne, instead of the proper spelling of Jeanne, which is found in body of the certificate itself. Marie-Antoinette was not, to put it mildly, an attentive student, nor was French spelling ever her friend. Another striking thing about this document is the list of the persons who signed as witnesses: King Louis XV himself, of course, but also, among other family members, Madame Adélaïde, who had just coined the phrase “The Austrian Woman,” her sister Madame Victoire, and the Duc de Chartres, future Duc d’Orléans, future Philippe-Egalité, who would vote, twenty years later, in favor of the execution of the groom, his cousin. Chilling. It would have deserved a few words of explanation in the notice next to the case. We see some artifacts linked to the wedding itself. There is a glaring omission here: the catastrophe during the festivities in Paris on that occasion. Fireworks near the present-day Place de la Concorde caused a panic movement in the crowd, and hundreds were trampled to death. This was interpreted by public opinion as a sinister omen. Then the exhibition’s timeline skip ten years, from the arrival in Versailles of the fourteen-year old Dauphine whom the aging Louis XV describes as “lively and very childish” to the popular rejoicing at the birth of the first Dauphin, Louis-Joseph. Again, this is a strange omission, because I believe these ten years missing from the narrative sealed Marie-Antoinette’s fate. This is when she alienated many courtiers and lost the love of the common people through her thoughtless and willful behavior, her passion for gambling, spending and generally having her own way about everything. In the exhibition, the only hints that everything is not quite right are excerpts, posted in several rooms, from Maria Theresa’s letters admonishing her daughter to be more serious in her pursuits and more affectionate towards her husband. Maria Theresa was right, of course, but being her daughter must not always have been easy. The best part of the show is probably the collection of portraits of Marie-Antoinette, both painted and sculpted. In one of the rooms, you have three different busts of Marie-Antoinette as a grown woman displayed together, from different angles. I had seen individual busts of the Queen, in particular the famous one by Houdon at Versailles, but I had never experienced anything like this. Marie-Antoinette simply came to life before my eyes! I felt exactly like Gabrielle, my heroine, when she first met Marie-Antoinette: if ever a woman looked like a queen, this one did. Her nose was prominent, aquiline, far more so than in any of her painted portraits, and her head was thrown back in a proud, willful fashion. A physically impressive, imposing woman. I was able to imagine what it must have felt to find oneself in her presence. Across the room is the great portrait in Court dress by Elisabeth Vigee-Lebrun. It was meant as a gift to Empress Maria Theresa. Marie-Antoinette was so pleased with it that Madame Lebrun became her favorite portraitist. But, as I mentioned earlier, neither Madame Lebrun nor less able painters captured Marie-Antoinette’s image as well as sculptors did. I also take issue with the display of very poor copies of Madame Vigée-Lebrun’s Marie-Antoinette en gaulle, and the fine portrait of the Queen with her children by Wertmüller. The dismal quality of the copies is an insult to the originals. I understand that those were unavailable (the Wertmüller in particular was deemed too fragile to travel) but decent reproductions would have done much better. The “Agent of Austria” part of the exhibit did not do much for me, though it emphasized the fact that Marie-Antoinette, to many French people, was the enemy within. I would have liked to see a portrait there of the Count de Mercy-Argenteau, Ambassador of Austria to the French Court and Maria Theresa’s most able and dedicated spy. The least of Marie-Antoinette’s faux pas never escaped his notice, nor did he fail to report it to Maria Theresa. Yet Mercy-Argenteau was nowhere in sight, though excerpts from his letters were quoted more than once. Where the exhibition shines, apart from the remarkable collection portraits of Marie-Antoinette, is in the display of the furniture and objects ordered by the Queen for her private apartments in various palaces and châteaux. There are pieces of extraordinary refinement and luxury, for instance the astonishing mother-of-pearl furniture made for the Queen’s boudoir in Fontainebleau. The bronzes and furnishings dating from a few years before the Revolution are simply amazing in detail. For her bedroom in Trianon, the Queen did not want gilded wood any more. She ordered furniture that was exquisitely carved to imitate wicker interwoven with floral motifs. A search for simplicity in the utmost luxury. For a reason that is not entirely clear to me, the organizers of the exhibits chose to display these pieces in the middle of theater sets. How not to compare the light, delicate, delightful jewelry case, inlaid with porcelain, Marie-Antoinette was given as a teenage Dauphine, and the new one, of monumental proportions, she orders years later? Indeed she has purchased many jewels in the meantime. And precisely trouble comes from another piece of jewelry Marie-Antoinette never wanted, owned or wore: the famous necklace incorrectly known as the Queen’s Necklace. A white saphire copy of the infamous jewel is there (the original was sold diamond by diamond by the husband of the swindler, the false Countess de Lamotte.) One has to agree with Marie-Antoinette on this point: this was a truly hideous piece of jewelry. This part of the exhibit is announced by a a large broken mirror. This, I suppose, is a metaphor for the fact that the Queen’s already tarnished reputation was shattered by the Affair of the Necklace. A few words of explanation on the scandal would have been more helpful for most visitors, and I, for one, could have done without this bit of melodrama. The story of Marie-Antoinette is compelling enough without the need for such over-the-top touches. Would not it have been more appropriate, for instance, to enlarge the face of the Queen’s great portrait with her children, also painted by Madame Lebrun? This was done in the exhibition catalog. Here Marie-Antoinette looks sad, preoccupied. We have a clear sense that the luxury displayed in earlier parts of the exhibit is not enough any more. But the Queen continues to throw herself into runaway spending. Her dame d’atours (Mistress of the Wardrobe) the Countess d’Ossun, tries – without much success – to control the spending on clothes, ribbons and feathers. I looked at the portrait of Mademoiselle Rose Bertin, from a private collection. Rose Bertin, a buxom lady with a round face and dark, shrewd eyes, was a redoubtable businesswoman. She made a fortune supplying the Queen’s dresses, and feared not Madame d’Ossun and her unheeded advice. An example of the poor job the exhibition does of explaining things was that two ladies next to me were shaking their heads at the portrait of Mademoiselle Bertin, remarking gravely how altered the poor Queen already was. Certainly, Rose Bertin looked nothing like Marie-Antoinette. Most notices are placed at hip level, which does nothing to enhance legibility. Now, speaking of the Revolution, I entered a vast hall, painted black, going downhill and becoming narrower in the distance. Compared to this, the earlier idea of the broken mirror seems the epitome of subtlety. While we are at it, why not have have a loudspeaker blaring: “And from now on, folks, it’s all the way straight to the guillotine?” At the same time, the rather distracting music that flooded the rest of the exhibit suddenly stops. It is replaced by the droning of the air conditioning, now on its chilliest setting (is this part of the “special effects” as well?) Shivering, I regretted to have left my coat at the vestiaire downstairs. Thanks to the starry, starry night lighting, the notices next to the display cases in that last part of the exhibit are next to illegible. But the cases themselves are adequately lit, and the objects there most interesting. We see a collection of satirical images of the Queen. Their placement in this part of the exhibit, however, gives many visitors the incorrect idea that pamphlets targeting the Queen date from the Revolution. In fact they began circulating decades earlier. We come to the Queen’s imprisonment, first at the Temple. The Queen’s furniture, modest though adequate by the bourgeois standard of the times, is in stark contrast of the luxury of the pieces displayed earlier. I caught myself regretting the no-nonsense, and far more moving, display of the same pieces at the Carnavalet Museum. There, you had the impression of entering the royal family’s living quarters. Here, you tread carefully not to step on another visitor’s feet in the dark. There is one of the daily reports on the health of Louis XVI, now Louis Capet. He had coughed much the night before. Why? The curators of the exhibit do not tell us about this (or if they do, I missed it in the surroundings shadows) but the King had suffered for many years from tuberculosis, a disease he had apparently transmitted to both of his sons. But soon Louis’s condition soon becomes irrelevant: he is tried for treason by the National Convention, sentenced to death and executed. And, still in the Temple, the Queen, now deposed, jailed and widowed, arranges again to have her portrait taken, though now in a very different style. Then Marie-Antoinette is separated from her children. The former Queen is moved to still grimmer surroundings: the prison of La Conciergerie, next to the Revolutionary Tribunal, where she will be tried a few months later. The rest is known. I saw the Queen’s last letter to her sister-in-law, Madame Elisabeth, a very moving missive, though, as noted by the curators, of disputed authenticity. For one thing, the spelling is flawless. Also, to me, its composed, majestic tone is too different from the Queen’s last message, this time of unquestionable origin. Then it was the last part of the journey, a moment seized by a sketch attributed to the painter David. One cannot imagine a grimmer image, and yet Marie-Antoinette still looks like a queen. After this, the obligatory passage through the gift shop felt anticlimactic. I avoided the assorted Marie-Antoinette paper dolls, pillows, umbrellas, fridge magnets, pencils and key chains and was content to purchase the catalog of the exhibition. I am happy to report that it is fortunately exempt from “dramatic” touches. My impression? In spite of a sometimes shoddy or tasteless presentation, the collection of portraits and objects assembled is so exceptional as to justify at the very least one visit. I was sometimes irritated, but the exhibition did deepen my knowledge and understanding of a complex and dramatic historical figure.